On Sale £15.95 - all incl (No hidden extras). Brands like: Cuno... Ametek ... Liff ... Plymouth ... Bruner ... Noga... Pentek... Homebase... Screwfix... Kemflo and many Other brands including reverse osmosis pre filters. 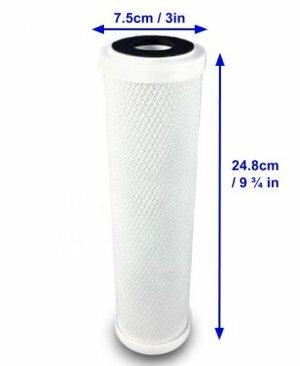 This top quality filter will replace any cartridge types that are 9 and three quarter inches length x 3 inches or less diameter. With a 1 inch aperture at either end. If your existing filter looks anything like this it can probably be replaced by our specially made cartridge. See why below. Will It Fit My Existing Water Filter? Your new filter will restore the water to its fresh natural state, improving the taste of your drinks and cooking. Firstly: in the bad old days water filters would come in all shapes and sizes. The aim was to force customers to return to particular manufacturers. However in recent years there has been a growing move to standardise the sizes of filter cartridges. Now about 80% of all cartridges are the "universal ten inch size". Secondly: the great majority of water filters are made from carbon. And the great majority of carbon filters basically consist of burnt coconut shell. 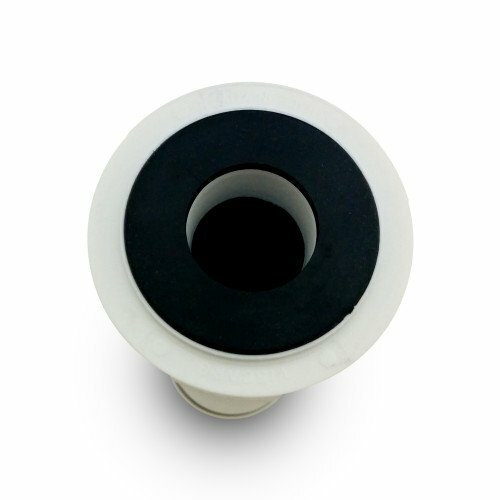 It is a question of exactly how it is moulded into the required filter shape during the filter manufacturing process. For example, the carbon might be cut into grains and placed inside a hard cartridge case (Granular Activated Carbon / AC). Or they might be compressed into Carbon Block and typically be surrounded by a mesh - as is the case with our specially made "10 inch" types - see above right. While Carbon Block is now generally seen as being a superior method of filtration over GAC, they basically do the same job. The point is that as long as the size of the cartridge is correct, one type can be changed for the other. Fast flow rate - 3 litres per minute. That's fast enough! Excellent Customer Feedback from many satisfied customers. The other thing to look for in any water filter is what micron size the cartridge filters down to. A micron is a millionth of a metre, so 100 microns is a tenth of a millimetre. A human hair is about 75 microns in diameter. 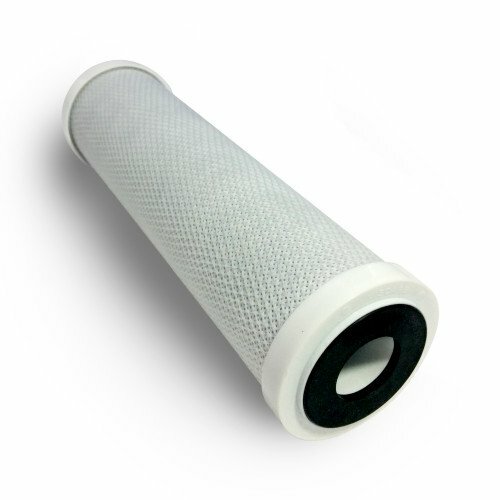 Our filter cartridge is a top quality carbon block cartridge that filters down to 5 microns. Five micron cartridges are the standard size for good quality domestic water filters. It is very likely that your existing cartridge is 5 microns - assuming it is not there to filter out something very specific. 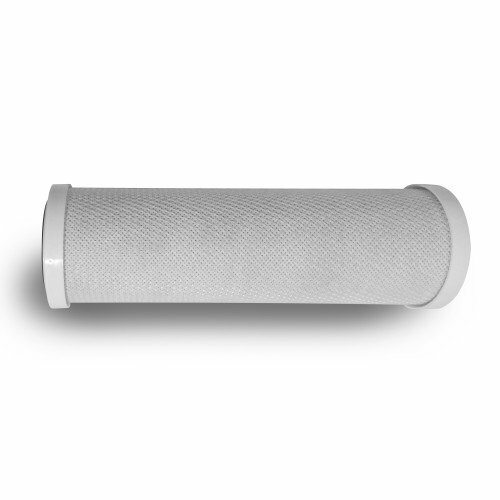 You can see what our 5 micron size filter removes - Click Here. The next size down from 5 is 1 micron. This is fairly unusual so if you know that your filter is 1 micron you would need to check if there is any specific reason for that. But perhaps it is supposed to stop a specific contaminant like bacteria. Now the best way to filter out bacteria is using filtration methods such as Reverse Osmosis or a combination of approaches – so 1 micron is not necessarily the best solution for that anyway. Do you have a private water supply? If you aren't on the normal mains / municipal supply then you might need special filtration – and even a 1 micron carbon cartridge might not be the best thing. (Click here to see solutions to specific drinking water problems). Do you have another special water supply situation / needs – for example you might have lead pipes… or a special health condition? If so, unless you are looking to replace Reverse Osmosis 10 inch pre filters (if so, good: we can help you. 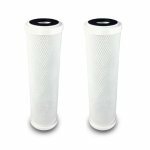 Our "ten inch" filters will do the job) – this might be a good time to review what the best water filter solution would be for you. 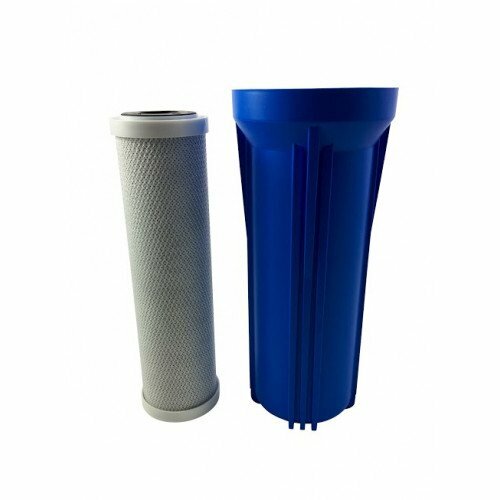 To check whether our standard cartridge is suitable for your water filter you need to check the size. They are 9 and 3/4 inches (248mm) high. This height includes the rubber seals at both ends. They have a 1 inch hole at either end, in the middle, to slot into the housing unit. Their diameter is approx 66mm. However, they can replace cartridges with similar diameters. The main thing is to make sure that the height is correct and they have a 1 inch hole at either end, in the middle, to slot into the housing unit. Sounds right? Then you can order your compatible replacement cartridge now. Please note that your new filter will need replacing every 6 months or so. (We remind you when it's time). If the measurements don't sound right we do have other types of filters. But we'd need to know more. Is there any information on the make ... manufacturer? Try our Replacement Cartridge Matching Service. This height includes the rubber seals at both ends. They have a 1 inch hole at either end, in the middle, to slot into the housing unit. Their diameter is approx 66mm. However, they can replace cartridges with similar diameters. I have used UK Filters for a few years now, first class products & service. 6 month phone reminder very useful. 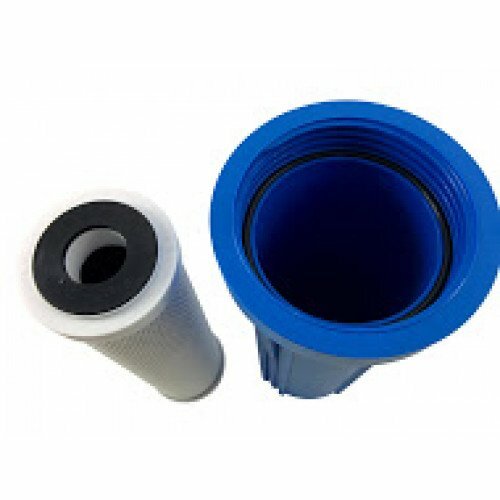 We have used this company for several years for the purchase for replacement cartridge filters. Their service has been excellent. Easy to use website, quick delivery, plus follow up email to confirm delivery and everything is Ok. Last but not least a reminder email; based upon the purchase date of my current cartridge, that my current filter is reaching the end of its recommended service life. Very helpful and efficient. They send a useful reminder when renewal is due but are not to pushy. UK Water Filters Ltd is a fantastic company to deal with and an expert in their field. They were really helpful when I had my filter fitted and supplied everything. To reorder a new filter is just a click of a button. Highly recommended and great prices too. I have used this company, in fact it’s the only company I have used for many years to replace my filters and buy other items. They have always been helpful and understanding of any questions I have had and always provided the service that these days is unexpected. I have had not complaints or reason to complain about any item. The delivery is fast and packaging now without the use of plastics which is another plus on their side. The items are good and very easy to install, their follow up email to see if all is ok is refreshing too. The most impressive aspect is the speed of their delivery... next day on both occasions, excellent ! Brilliant service excellent product and a price to suit the pocket.Would not think of going anywhere else for a similar product.Well done UK filters. A dramatic change on how the filters are packed for postage - it is totally re-cyclable - No annoying polystyrene to dispose of. All we need now is the ability to recycle the used filters - anybody got any ideas? The latest shipment of 2 water filters has arrived and I have replaced the old cartridge. No sign of the original shipment though. Thanks for sorting it out. Delighted with the service received when we ordered this product for the first time. Could not believe the price which was about 1/3rd what we had been paying. Delivered quickly and fitted easily because of the detailed instructions supplied. Very happy with the product itself too. Bought a new house with water filter installed - and a sticker with UK Water Filters number stuck to the filter. Were very helpful when rang for guidance. This is our second order which arrived promptly, well packaged and nothing missing. Even has new contact and replacement reminder labels to stick on the filter!! I purchased a water filter kit (filter, plastic pipework and dispensing tap unit) from them over 6 months ago to replace a unit for which I could no longer get filter cartridges. (The old unit was NOT supplied by this company). Price good, delivery good, product well packaged and handy tips included. They also supplied an inline isolating valve to simplify changing the filter cartridge. They noted my purchase date and sent an email prompting me to change the cartridge on the 6 month anniversary on the installation. Again the supply process was good and the product good. All good, arrived very quickly, as described and as ordered. Fits perfectly. Very happy with the service. Friendly efficient service, will definitely use again. I feel I have found the right company to deal with for my future filters orders. I have dealt with this company for about two years. The service given is impressive from help with the start up package and reminders as to when a new filter is required. So simple. No more worrying; all that is done for you. Having searched all our local shops and building centres to find a replacement filter to no avail we then looked on the internet. This is were we found 'UK Water Filters LTd'. There site was easy to read and after a very short time we found they had the filter we needed. Having ordered and paid on-line the filter was delivered in 25 Hrs.Fitting the replacement was very easy along with the stickers to show were the filter came from including phone number. We would certainly recommend this supplier. Well done 'UK water Filters Ltd.
UK Water Filters Ltd have for some time provided an excellent service. Their filters do what they say and the company is very sympathetic and helpful with whatever questions I have had. Well, its when something goes wrong that's the test of good customer service and I must say that when it happened to me UK Water Filters were absolutely excellent! After a hard day, getting home and finding 'er in doors moaning about a filter fault was the last I needed. Ah well, its late at night (22.45) but I'll bash out an email hoping for a response the following day but alas, within minutes I had a reply from Ed Parry and following a couple of swift communications again with Ed and Jonathan the problem was sorted with parts on the way and the problem plus my ear ache resolved! It's unusual in this day and age - but this was service at its very best. They provide a good service to those of a certain age, this includes me, who forget when to change the filter. The renewal prompt is very welcome. Fast service and excellent communications. Effective reminder system, fair prices and quick delivery. Good price prompt delivery, excellent service, follow up email. This business Is like a breath of fresh air, Truly a company that is interested in customer satisfaction. Reliable, helpful, and the water filter works really well too! Prompt delivery, filter easy to install and has made a vast improvement to the taste of our water. Iv'e had my water filter installed now for a couple of years and I am really pleased with it. It was inexpensive, simple to install and yet works perfectly. In my local area the taste of clourine in the water was really strong and it was one of the reasons that prompted me to look for a filter. This one does the job and much more besides. I am more than pleased with the filter. Considerable cheaper than the one that came with the taps. So easy to fit and only has to be replaced every six months. Well done UK Filters. I recently had a problem with the connectors for the water filter in the house we have just moved in to. Ran around all the local plumbing / diy places with no luck. Came across this company during an on line search. Contacted them via email to explain my situation. They were incredibly helpful in trying to resolve my issue. At no time did they try and 'hard-sell' me any products that I didn't need, and when they did send me a new water filter with connectors which didn't help, they immediately sent me a different filter with a pre-paid envelope to return the original. Their whole manner in dealing with my problem left me with a feeling of complete trust in them. Will definitely be using them again. This company offers exceptional customer service, going the extra mile to make sure you are making the right purchase and giving excellent advice in a friendly manner. You even get a follow up e mail to see if you are happy with your purchase, need any advice with fitting etc. Delivery arrived when they said it would, well priced. I would highly recommend this company to anyone looking for a good quality water filter at a sensible price. * Efficient in supply & delivery. * Very helpful on any queries I may have. I always receive a reminder when the filter is due to be renewed which is extremely helpful. The ordering process is very straight forward and the followup service is excellent. I cannot recommend this company enough. Fast and efficient service. Have been ordering from them for years, they even send you a reminder to order the filter when it is due to be changed! 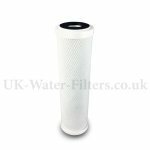 When I enquired about a filter cartridge for my water filter using their web site I found the one that needed quite easily. I ordered one and was very pleased with price as it was less than I had been paying another company. The every six months they remind me that it needs changing with a simple reorder system and quick delivery. I am very happy with the service. The filters are good quality and they arrived well packed. I have dealt with this company for a few years now and they have gone above and beyond to help me. They keep in contact and remind me when my filter is due. Would recommend them every time. Your after-service is excellent. May you get many more customers. I don’t have any suggestions unless you can arrange for the postman to fit the filter for me! Very quick delivery, very helpful, they remind you when your replacements are due. Even offer advice regarding fitting. Bought my previous filters from this company and have been totally impressed. Fit one of these filters they are essential for drinking clean clear water. Your morning cuppa will taste much better. Customer of UK Water Filters for nearly 10 years and have always been very impressed, and totally satisfied, with both their service and products. I can highly recommend this company - they even email to remind me I need to change filters! When I ordered my filter assembly 6 months ago It took a while to arrive but when it did it was well packaged. All items present and correct and easy to fit. Very good service from UK Water Filters with a reminder to replace the filter element and at an excellent price. Very pleased with product. Thanks. I always use UK Water Filters - excellent prompt service and a no-hassle email reminder when replacement is due. From six monthly reminder , to ordering and installation advice aswell as the taste of filtered water on tap...5 Stars! Excellent service and product. Keep up the great work! Used these filters from uk-water-filters over many years. Found them to be excellent. Filtered water used for all cooking and drinking. Found the staff to be very helpful when I had a Tap problem. New one supplied F.O.C. Thank you for the excellent service. My replacement filters arrived in good time .Full marks for the excellent service.you provide.Also I would like to thank you for reminding me that my filters are due for renewal.Have been using UK filters as far I I can remember and I highly recommend to every household to have one The water definitely taste better as the smell and taste of chlorine is removed. Really easy fit, seals included a great price and nice clean water again. Thanks again guys for making it easy at the right price. Useful reminder email, quick delivery, always fits, works well. Delivery was very quick and delivered as ordered. 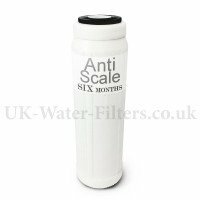 The filter makes a great difference to the water quality, will re order when the time comes. Quality product delivered on time at a fair price with a reminder service when cartridge needs changing. The water filter we received is very good as usual. Thank you. My mum has had one fitted as well and she was pleased with her filter. Thank you for keeping in touch with us, I do sometimes forget when the filter need's changing so your prompt really helps. Thank you for fantastic service, with a very reasonable price compared to the previous company that I left to deal with you. Great all round. Great product. Tip: Put some silicon grease on the filter housing screw thread to make it easier to unscrew. Generally the service I found from the company was excellent and staff ensured my water filter was up and running. Spare parts with low cost and advice was very good to to fit them. I will now rely on this company for all matters, parts etc from now on. This is an excellent product and the new packaging is much better - a proper cardboard box that protects it well in transit. It is usually delivered within 2 days but this time it took 5. Not certain whether this was due to UK Water Filters or the Royal Mail. I have been dealing with company for many years and I have to say they are excellent. Fast delivery and more importantly they care about customer loyalty. I have no hesitation in recommending them to anyone considering purchasing water filter products. I would not want to be without a fresh water filter cartridge. The difference it makes to a glass of water is amazing. No more chlorine taste ...just fresh water! Great product and brilliant service thank you. I have used these water filters for several years now and although they are supposed to be replaced every six months I have gone over time. The water still tastes good compared to the tap water so it's still getting rid of the chlorine etc. I do understand however that there can be a build up of other harmful things. Recently put a mini tap in the plastic 1/4 inch inflow line to make changing the filter easier which helped a lot to reduce the hastle every six months. Very quick service from the supplier. This is an excellent product from a dependable company. The instructions provided make refitting a filter a straightforward task. It is very worthwhile where we live, as occasionally the water gets "cloudy". We are now ensured of a clean supply of fresh-tasting water. I got lots of Brownie points when I installed the filter under our kitchen sink about a dozen years ago. We reckon it's like having Evian on tap. Even the dog prefers it. I've been buying the filter elements from the local plumbers' merchant regularly ever since, but this time tried your service for convenience and price. We have not been disappointed so may well be using you again, though it will be a while yet: I installed the spare element and now have the two you sent held for later. 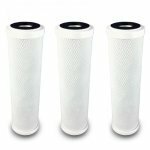 I have used these replacement filters for over ten years now and categorically say I have always found them to be reliable and long lasting. This is my first time at reviewing a product on line! I've had filters from UK Water Filters for the last several years and they have all "cleaned" the tap water very well, in fact each time I've changed one I've been surprised how much " stuff" it collects, the old filters are always black the new ones white! Both their renewal notice and the renewal stickers are always a reminder to change the unit. One final comment, the filter when delivered fits easily through my letter box flap, no need to wait in! 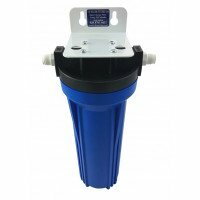 I have been using the water filters from UK Water Filters for some years now, and found both the filters and the service from the company to be excellent. An email is sent when it is time to renew, the filter arrives within a couple of days and fitting them is straightforward. Our water quality is greatly improved. Any queries are speedily dealt with by phone or email. I remain a satisfied customer! I am very happy with both the filter and the service you provide. 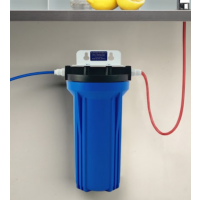 Excellent response time to inquiry, fast efficient delivery, reminder notice when filter needs replacing, and the product does exactly what it says on the box delivering clean filtered water. We are very pleased with our water filter replacement, it makes such a difference to the taste of the water. We have had the filter for several years now and the replacement filters are so cheap and easy to replace every six months. many thanks to the team. Fitted OK no problems. The product appears to work satisfactorily, but by the nature of things a proper scientific analysis would be required to assess its effectiveness. Good to have reminders when filter due for replacement. Prompt delivery and filters good value. Filter arrived safely and is working well. My tip?? I fill my iron straight from the filter and haven't had to 'clean' it since. Many thanks for a brilliant service. Good Service, reminders appreciated. Replacement cartridges are easy to fit. I received the filter on time, perfectly happy with the service. Congratulations, it’s good to deal with a positive company who know the product they sell. Have bought this product several times, very competitive price. The Company send reminders without being pushy, very polite and pleasant. Will also help with any other queries. Excellent quality goods, excellent service at all times.i would highly recommend this company. Always excellent service from a friendly, helpful firm. Fitting instructions useful & easy to follow. Speedy delivery & easy to fit. Very satisfied. Replacement Water Filter Cartridges are simple to use and effective in performance. No trouble has been experienced in all the time I have been using them. The service is efficient and supportive at all times. Absolutely 1st Class service. Fast, efficient and highly recommended. I have been using UK water filters they send you a reminder (good for me ) when they need to be changed. They improve the taste of the water easy and quick to fit. Highly recommend . A good product relatively easy to install and maintain. Good back--up advice service offered.should you get a problem. The filter arrived promptly and was not difficult to refit, even by a septuagenarian ! The after sales follow up all adds to a very happy and satisfied customer. It arrived OK and fitted my bench top filter was bought from Australia where they are very popular very pleased with your service will use again. This company has excellent customer service. Have never had a problem. The products work and delivery is extremely prompt. The reminder emails are a definite plus! UK Water Filters have provided me with excellent service and product for many years. Their service leaves nothing to be desired. They remind you when the filter is due replacement and make ordering simple. A few days after the filter has arrived they then send an email asking if there were any problems. I doubt there could be with the comprehensive instructions provided. First class company. Had water filter for several years.Normal tap water ok,but often tasted a bit of chlorine .Water filter turned it into bottled water quality.tea tastes better and coffee has been transformed to a real treat.Filter easy to fit and replace cartridge.Company even remind me when replacement is due.Would highly recommend to anyone who likes tea and coffee how they should taste. Great Service, reminder email and the filter. reviews, This is a company that makes you feel that you, the customer are important to them, by way of sending reminders when your filter is nearing time for renewal, and after you have ordered your product sending an e-mail to make sure it has arrived in good time and has been fitted with no problems. Thank you UK Water Filters for a breath of fresh air. I've dealt with UK water filters for some years, service has always been fast & reliable, with a reminder that the filter needs to be changed every 6 months. I would recommend this company. Congratulations UK Water Filters on a 1st class service. The reminders and follow up emails are appreciated. Once again i received excellant service with my order and top quality product. Will always buy filters from here and im always happy to recommend to collegues and friends. Very professional and efficient, but friendly and helpful. This is the first time I have tried this kind of filter. It was sent speedily and fits more easily than the previous one. It does its job well. I have always found over the past three or four years that the service I get from UK Water Filters has been first class. 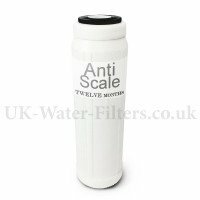 The price is excellent, and as well I was unable to obtain a filter of the size I required from anywhere until I came across UK Water Filters on the internet. I would recommend the company to anyone. yet again I have got prompt service for my new water filter - with an easy to use web-site and a value for money price - keep up the good work.. Very quick despatch as soon as ordered. Excellent service. Reminder every six months to change the cartridge. So, very impressed. Have bought this filter for years. Always arrives promptly and easy to fit. Never any problems. Can reccomend filter and company without hesitation. Used UK Water Filters for years and have never had a problem. Reminders sent every six months, so I never forget to change it. Also very easy to change. I only order filters from this Company they always arrive the day after they are ordered. The fact that you are senta reminder when they need to be changed is eextremely useful - many thanks. Have been using this company for many years without issues. They can be commended & recommended. Been conned by my filter supplier for too long with high prices. Will only use UK water filters from now on. Good value, reliable product, fast delivery, competitive price. I do appreciates the reminders to replace the cartridges, it would be so easy to forget and thus have substandard water rather than the clean fresh taste of an active filter. The 6 monthly reminder is helpful. Delivery is prompt. No complaint about the quality of the filter. Excellent service, quick delivery and great product. Fitted and fully functional in minutes. Through UK Water Filters this cost us ¼ of the price that the original company that fitted the filter wanted to charge us! We will be a regular customer! I am now om my 4/5 replacement under sink water filters .I have had A! service every time Delivery very quick as other people mention. The filter works fine every time and we get nice drinking water in a area which is not the best tasting water .I always stick to the 6 months replacement and that way I know we will get good water. Just a quick note to report that the filters arrived in good condition today, that they fitted the Culligan housings and have been installed. Thank you for the excellent advice and service. The filter arrived very quickly, has been fitted & seems to be working perfectly. Thanks for not only the excellent service but the reminder email as well. Thanks. Excellent description on site helped me choose which filter I required. This was the main factor I used your company. Quick delivery and good product. I will use you again. Stickers with filter a good idea for me and you getting return business.